As in previous years, I “celebrated” Groundhog Day by dusting off my ancient VHS copy of the movie, “Groundhog Day” and viewing it on my equally ancient VCR. 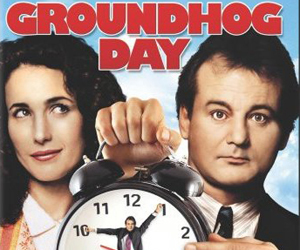 My appreciation of this film goes beyond laughing at Bill Murray’s humorous quest to capture the affections of Andie McDowell, day-after-day,in a stalled world where the calendar never advances to February 3. Maybe I’m stretching it a bit but I see Murray’s situation- stuck in the eternal present of Punxsutawney, PA- as a life lesson for sixty-somethings. At first Murray deals with his situation by indulging his greed, lust, ego, and general contempt for people. Then, in despair, he tries killing himself in a number of creative ways. When that fails, he figures he’ll start learning and perfecting some new skills – ice-sculpting and piano-playing- (though, at first, with an ulterior motive of impressing Andie McDowell). Finally, he begins feeling something like empathy for the residents of this community, using his new knowledge and skills to help or entertain others. Could this be a metaphor for our lives? As sixty-somethings, we see a future that is becoming more circumscribed and shorter. Long standing dreams may be less attainable. Health concerns rear their heads. But “Groundhog Day” teaches Bill Murray, and us that we all live in the real and vital present. We have today. We can make the most of what we have. We can actively engage in caring for what and whom we value. There is still opportunity to learn, to grow, and to change, to help heal the world and ourselves. The snow is sifting down, the path outside is treacherous, the wind is mournful but I’m not feeling trapped. I have chicken chili simmering in my crock-pot.I have my books to read and my blog to work on. Once again, “Groundhog Day” has reminded me of the power of one day at a time. Lovely, and a mindful state of being.